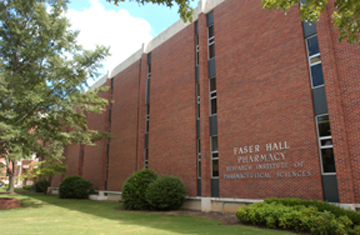 Founded in 1908, the University of Mississippi School of Pharmacy is the state’s top rated pharmacy school. Through its education, research and service missions, the school aims to improve the health of our state citizens as well as the nation and the world. The school is comprised of four academic departments (BioMolecular Sciences, Pharmaceutics and Drug Delivery, Pharmacy Administration, and Pharmacy Practice). Graduate degrees are offered by three departments. Students of the Pharm.D. program spend their first two years studying at the school’s Oxford campus, and the third and fourth years in coursework and rotations at the school’s campus at the University of Mississippi Medical Center in Jackson. The Research Institute of Pharmaceutical Sciences (RIPS) is also housed within the School of Pharmacy. RIPS was established to discover and disseminate knowledge of natural drug products, develop and commercialize new products, improve public health and stimulate the economy. Within RIPS are the Pii Center for Pharmaceutical Technology, Center for Pharmaceutical Marketing and Management, the National Center for Natural Products Research and the Center for Clinical and Translation Science. The Pii Center is devoted to research related to hot-melt extrusion and other pharmaceutical processing technologies. The CPMM advances research, teaching and service in the areas of medication use and health outcomes, management of health care organizations, and the marketing and utilization of cost-saving and appropriate medications in all segments of the health care industry. The NCNPR is the nation’s only university research center devoted to improving human health and agricultural productivity through the discovery, development and commercialization of pharmaceuticals and agrochemicals derived from plants, marine organisms and other natural products. The Center for Clinical and Translational Science was established in 2017 to facilitate clinical research. It is based on both the Oxford campus and at UMMC. Continuing education opportunities are offered through the Division of Pharmacy Professional Development. Live CE programs are available to pharmacists at various locations throughout the state. The School of Pharmacy’s Doctor of Pharmacy program was fully reaccredited in 2012 by the Accreditation Council for Pharmacy Education, 135 S. LaSalle Street, Suite 4100, Chicago, Illinois 60603-4810; (312) 664-3575, (800) 533-3606; or fax (312) 664-4652. Dean David D. Allen, R.Ph., Ph.D.
Outcomes Assessment and Learning Advancement Alicia S. Bouldin, Ph.D. Academic Affairs Kris Harrell, Pharm.D. Research and Graduate Programs Soumyajit Majumdar, Ph.D.
Clinical Affairs Leigh Ann Ross, Pharm.D. Assistant Dean of Student Services – Oxford Chelsea W. Bennett, Ph.D.
Assistant Dean of Student Services – Jackson Katie S. McClendon, Pharm.D.